PACSCL-ORGANIZED PROJECT TO DIGITIZE 140,000 PAGES OF EARLY MEDICAL EDUCATION RECORDS FROM SEVEN PHILADELPHIA LIBRARIES. Two-year initiative headquartered at the College of Physicians of Philadelphia supported by the Council on Library and Information Resources (CLIR). Project partners for this initiative are The College of Physicians of Philadelphia; The Legacy Center, Drexel University College of Medicine; University of Pennsylvania Libraries; Pennsylvania Hospital Historic Collections; The Library Company of Philadelphia; American Philosophical Society; Thomas Jefferson University Archives and Special Collections, and PACSCL. The College of Physicians serves as the fiscal agent, with librarian Beth Lander serving as principal investigator. Kelsey Duinkerken, Jefferson, is the co-principal investigator. Explained Lander, “Philadelphia is a city of ‘firsts’ in the history of American medicine. Through these ‘firsts,’ the history of Philadelphia medicine is synonymous with the history of American medicine.” The selected time period (1746-1868) documents the development of American medicine from its roots in European traditions to what became a uniquely American system of education. The initiative will digitize, describe, and provide access to 140,000 pages of lecture tickets, course schedules, theses, dissertations, student notes, faculty lectures notes, commencement addresses, opening addresses, and matriculation records, sharing not only the voices of the medical greats, but also the often unheard voices of students. “Because of physicians’ flow between institutions across the city, this project will allow physically siloed material to be viewed and analyzed in one place for the first time,” noted Duinkerken. University of Pennsylvania Libraries, Ms. Coll. 225, item 14. No copyright. Manuscript notebook kept by Robert Maxwell, a student at the University of Pennsylvania School of Medicine. This particular volume contains Maxwell’s notes on lectures delivered by Benjamin Rush during 1807 and 1808. The front of the volume, pictured here, contains a sketch by Maxwell depicting Rush’s views on the nature of fever. 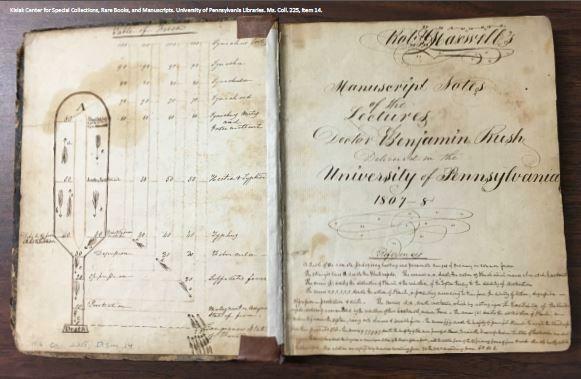 “Here at Penn we’ll be scanning over 800 handwritten medical dissertations done at the medical school before 1828 as well as more than three dozen manuscript student notebooks recording classes with Benjamin Rush and other university medical faculty,” adds Mitch Fraas, Curator of Special Collections at the University of Pennsylvania Libraries’ Kislak Center for Special Collections, Manuscripts and Rare Books. The Penn Libraries’ Schoenberg Center for Electronic Text and Image will conduct the imaging for some partners, as well as for its own collections. The primary sources in the project document the evolving pedagogy of medicine, from its basis in institutional and independent lectures, through tentative standardization of medical curricula in the mid-19th century. This collection will also allow researchers to read beyond dominant structures in the history of medicine, moving beyond the often hagiographic sources available on medical pioneers such as Benjamin Rush, Benjamin S. Barton, Samuel D. Gross, Thomas D. Mütter, Joseph Pancoast, and Edward Squibb. “Researchers will be able to tell stories across communities of gender and race, and through topics such as pharmaceuticals and American botany (including homeopathy), pedagogical methods, and the evolution of medical treatment,” says Margaret Graham, Managing Archivist at the Drexel University College of Medicine Legacy Center, whose records include those of the first degree-granting women’s medical college and the first homeopathic medical school. “For the Health of the New Nation…” will be a new ‘first,’ providing access to a deep corpus of content that will support research against the grain, and across the humanities. Digitized materials and metadata will be freely available via the participants’ own websites and also via the Internet Archive and/or the Digital Public Library of America. The Council on Library and Information Resources (CLIR) is an independent, nonprofit organization that forges strategies to enhance research, teaching, and learning environments in collaboration with libraries, cultural institutions, and communities of high learning. To learn more, visit www.clir.org and follow CLIR on Facebook and Twitter.